Representational, painterly, impressionistic, and inspiring—these are all perfect ways to describe Suzie Greer Baker’s paintings. Yet, what matters most to the artist is recording her response to her subjects in a fresh, direct way. Whether she’s painting a lush landscape on location, creating an evocative still life in the studio, or completing a commissioned portrait, Suzie paints with a loose, alla prima technique that is always evolving as she experiments with new approaches. “I first landed on my preference for direct painting in college,” she recalls. “Although we explored many styles, I can point to one assignment that had a profound effect on me. My professor, Peter Jones, arranged two still lifes of simple flower cuttings in glass jars. Her high school art teacher, Ken Tracy, and several college painting professors encouraged her passion for painting, yet Suzie’s pragmatic side led her to earn a Bachelor of Arts degree in Advertising and Fine Arts from Louisiana Tech University. Following her degree program, she worked as an ad agency Art Director before trading in her Pantone swatches for a brush and palette in 2008. The change was prompted by a move to the Middle East to pursue the next phase in her husband’s career, which created an opportunity for Suzie to devote herself full time to “the things that matter most,” including her fine art. 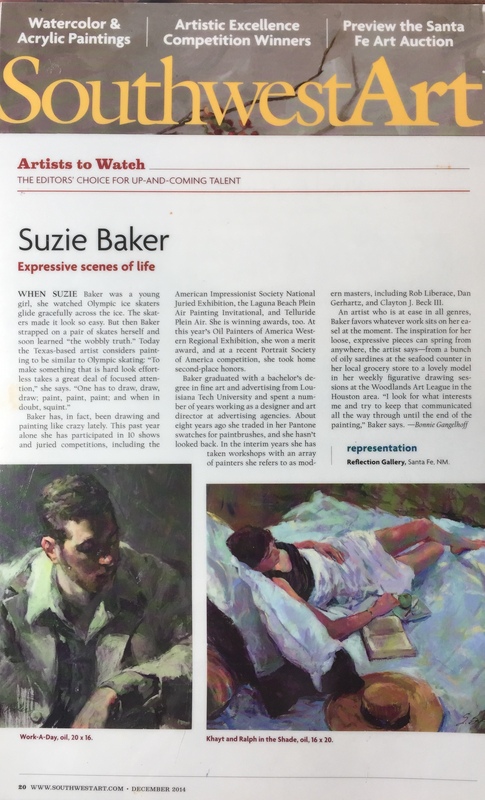 In recent years, Suzie has gained national acclaim, earning a stellar reputation for her versatility as both a plein-air landscape artist as well as a studio painter of still lifes, figurative works, and portraits. 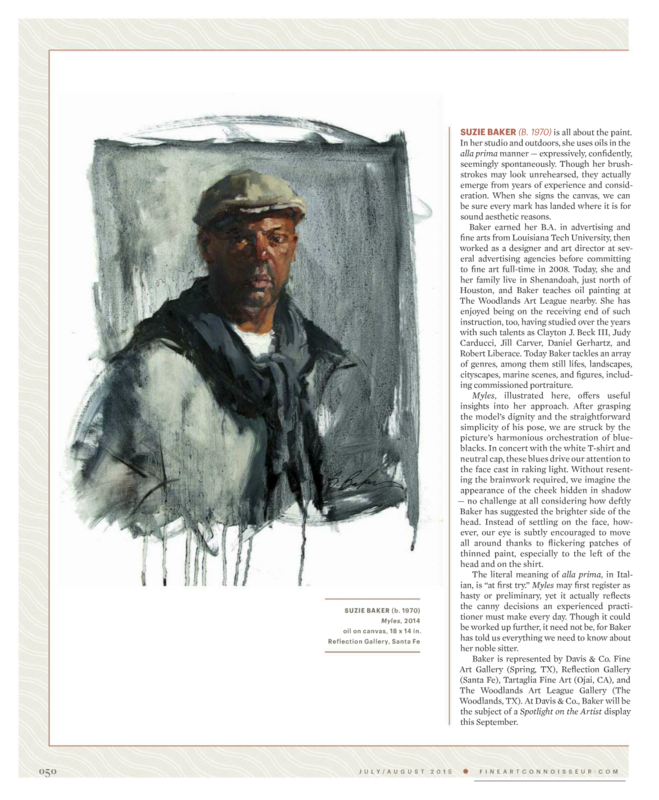 In fact, in the Art Renewal Center’s 13th International Salon, she was recognized in both the Plein Air and Figurative Categories, which is a truly remarkable achievement. Among the many other awards she’s received recently are Best in Show and Artists Choice Awards at the Outdoor Painters Society’s Plein Air Southwest (2018), Best in Show at Shadows on the Teche (2018), the Irvine Museum Award and Montage Award at the 2018 Maui Plein Air Invitational, an Award of Excellence from American Women Artists’ Tucson Desert Art Museum Exhibition (2017), and the Artists’ Choice award at the 2017 Telluride Plein Air Festival. Her award-winning paintings have been featured in such publications as Plein Air Magazine, Fine Art Connoisseur, and Southwest Art. Also known as a generous and uplifting teacher, Suzie has just produced her first art instruction video with Streamline Publishing. This artist also believes in giving back to the community of artists, and she is proud to serve as a Board Member with the Oil Painters of America. “Serving on the board with OPA is and will be a highlight of my career, primarily because of the opportunity it gives me to serve my fellow artists,” she says. “Being on the path of a working artist is a calling. I find helping others on their path a very satisfying pursuit.” She has also earned Signature Member status in numerous other prestigious art organizations: the American Impressionist Society, the National Oil and Acrylic Painters Society, the Laguna Plein Air Painters Association, the Outdoor Painters Society, the California Art Club, and American Women Artists. The motivation behind all of this activity is Suzie’s overarching goal to continuously improve her abilities as an artist—to express her response to the world around her in ever more fascinating and innovative ways. On a personal note, Suzie adds, “I love to travel and meet new people, which makes me well suited for the somewhat itinerant life of a plein-air painter.” But when she’s not on the road painting, or teaching, Suzie makes her home in Shenandoah, Texas, with her husband and two college-aged children. She says she loves, watching her kids become adults, eating good food around the dinner table, watching action movies with her son, and listening to audiobooks, but she absolutely hates ironing! To see more of Suzie’s work, please visit her website at suziebaker.com. 7th Annual Plein Air Salon Competition - Third Place Overall, and Best Plein Air August/September 2017.